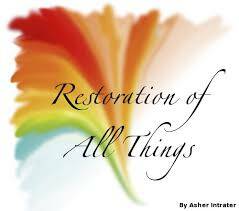 For me, to sum up what the Bible is about, from Genesis to Revelation, I would have to say creation, destruction and restoration. 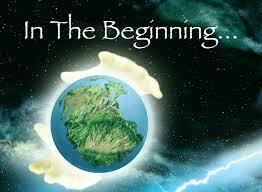 In Genesis chapter one, God creates the universe in six days. At the end of each day he pronounces that what he had created that day as good, beautiful, perfect. On the sixth day he created male and female in his image and declares that act of creation as Very Good. In chapter two we read that he created a garden with beautiful trees laden with fruit. Thus we have an incredibly beautiful creation of God, intended for mankind to enjoy. Unfortunately it ends all too soon. In chapter three of Genesis, destruction happens. Adam and Eve disobey the only command God gives them. They eat of the tree of Knowledge of Good and Evil. That knowledge destroys their intimate relationship with the Almighty Creator. It destroys their relationship with each other. The eating, the disobedience, destroys their relationship with the earth and all that is within it. They receive the Curse of God, and are denied the perfect creation of God. They are expelled from the garden. Much of the Old Testament gives us an account of more destruction. Cain destroys his brother Able. God destroys the earth with the great flood. Armies destroy armies. Nations destroy nations. Kingdoms are wiped out. It’s all bad. Almost. God did not leave humanity without hope. Even as he pronounced curses on Adam and Eve, he slips in a promise of restoration. Something to look forward to. He promises that one day the Seed of Woman would crush the head of the serpent (Genesis 3:15). God began the slow, but sure promise of restoration by choosing one man, Abraham, to be the father of a great nation. He chose an enslaved nation to escape their slave masters and become a powerful, godly nation. He revealed himself, his will and his laws to them. He chose David, the shepherd boy, a man after His own heart, to be king over this nation. These acts were bits and pieces of restoration that pointed to a time when a full restoration would take place. They pointed to the advents of Jesus. His first and second comings that the prophets wrote about. His birth in a manger, death on the cross and resurrection from the tomb; the first advent when God emptied himself, humbled himself and the Word became flesh. Before ascending to his place of power in heaven, he promised he would return one day to fulfill the scriptures promise of a full restoration. When he rose from the dead, Ephesians chapter two tells us that those who believe in him and the work he accomplished on our behalf on the cross, were also raised to Life, meaning we now live spiritual lives in right relationship with God the Father. Paul writes that all who place their trust in Jesus are justified, which means our sins are forgiven; God adopts us as his children, and sees us “just as if we had never sinned.” Not only that, but the same chapter of Ephesians tells us as Christ rose to take his place of power in the heavenly realms, we also are seated with Him in the heavenly realms. An incredible act of restoration took place. When we look at our lives we can clearly see that we are not in heaven and that we continue to sin everyday. So what gives? What kind of restoration is that? That is where the “Already, But Not Yet” comes in to play. 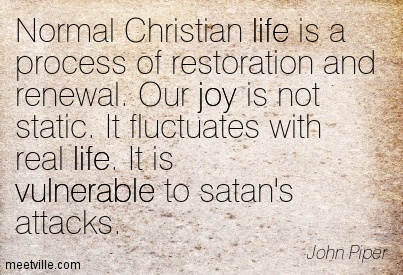 While our lives are incredibly better in Christ, they are not perfect. While we experience more joy and peace than ever before, we continue to struggle with times of conflict and sadness. That is the “Already” life. The “Not Yet” restoration fullness will take place at the end of the age when Jesus returns to set up his restored kingdom, which, according to the last couple chapters of the Bible, look a lot like the first couple chapters of the Bible. It’s a perfect creation where there is no more sin and suffering; where there is a River of Life and fruit trees. 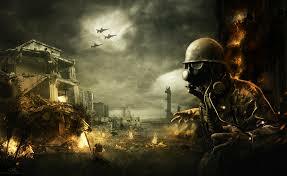 It’s a place where destruction is a thing of the past and everyone lives in love and unity with each other and God. So there it is. The story of the greatest book ever written, the Bible, summed up in three words – Creation, Destruction and Restoration.